The cost of travel is falling, thanks to factors such as more low-cost carriers in the market, the availability of deals on booking sites and technological breakthroughs. All these are providing the discerning traveller with more choices. Payment options have also increased and many of them come with lower fees. For instance, some pre-paid cards have lower transaction fees than those charged by credit card providers. The recently launched Merchantrade Money service, meanwhile, does not charge users for transactions performed with its app’s multi-currency wallet function, which allows them to buy and sell currencies at any time. This gives them the benefit of locking in rates just as they would be able to if they were using cash to obtain foreign currencies. Users of the app also receive a pre-paid card that allows them to withdraw cash from Visa-enabled ATMs around the world at the locked-in exchange rates, subject to the respective overseas bank’s charges. There is a RM10 charge for such withdrawals. Another pre-paid card that users can get is issued by BigPay, a subsidiary of AirAsia Bhd. As there are no fees charged, travellers can rest assured that they enjoy real foreign exchange rates for any transactions made. They may also receive other benefits such as discounts on AirAsia flights, pre-booked baggage and meals. In applying for these pre-paid cards, users have to go through a know-your-customer (KYC) exercise. After several business days, they will receive their cards, which can be loaded with up to RM10,000 using the free mobile app. Reloads are done via bank transfer. Perry Ong, MasterCard’s country manager for Malaysia and Brunei, says these services are made possible using the open-loop wallet system, typically issued in partnership with a processing network provider such as MasterCard or Visa. Currently, the majority of e-wallets in Malaysia use a closed-loop system. So, they can only be used at merchants that have registered with the service provider, which makes international transactions impossible. “The closed-loop system means that if I want to pay for food at a mamak stall, for example, I will have to check which e-wallet it accepts and I need to choose which e-wallet gives me the best deal. But when I go overseas, I cannot use them because the merchants there do not accept these payments,” says Ong. BigPay co-founder and group CEO Christopher Davison says consumers are now looking for better alternatives when it comes to overseas transactions as banks have always charged too much for cross-border payments. “Banks charge a lot of fees, but they do not offer better customer service. Sure, they incentivise users with a lot of benefits such as cashback and loyalty points. But they also charge exorbitant transaction fees, late fees and revolving credit fees,” he adds. “Some credit cards can charge users up to 5% for cross-border spend. That is crazy high. Imagine taking your family for a holiday in Bali for a week and being charged US$50 on top of a US$1,000 hotel bill. That is a very high unnecessary cost. Davison says this fits nicely with AirAsia’s objective, which is to make air travel accessible to all. “Consumers buy flight tickets at the cheapest possible price, sometimes at just RM1. Then, they pay tax and only for the add-ons they want. Later, they can use our financial services, which are fully transparent and provide them with the convenience of going cashless,” he adds. If there are no transaction fees, how does BigPay monetise its services? Davison says the company will never make money on cross-border payments. However, it may introduce paid services in the future, with the end goal of offering myriad products and services, such as a digital bank. “Lending and remittance are two areas we are looking at as they are the two areas which banks have always monetised. 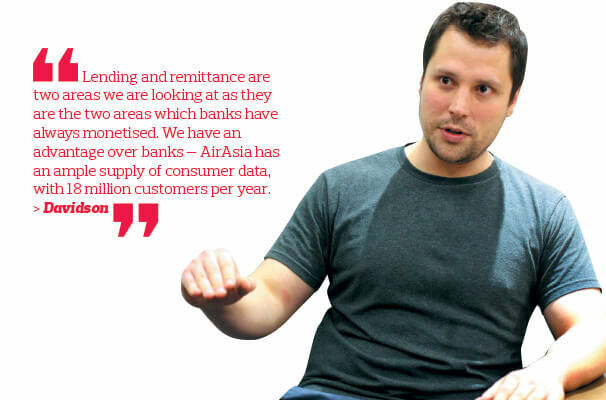 We have an advantage over banks — AirAsia has an ample supply of consumer data, with 80 million customers per year. When you fly on AirAsia, you have to provide your passport number, date of birth, address and other information, which we can use responsibly to offer better financial services at a lower cost,” he says. On Nov 19, it was reported that AirAsia would be tapping RHB Bank’s expertise to improve BigPay’s services. Remittance and treasury services are among the areas they are looking into. As a fully licensed e-money issuer, users’ funds are kept in a trust account at all times. BigPay also employs additional safety measures for peer-to peer transfers on its app such as fingerprint or passcode verification to ensure that only users can facilitate payments from their accounts. To adhere to Bank Negara Malaysia’s emoney requirements, users need to send a digital copy of their MyKad, wait for verification and the approval thereafter, but much less onerous than opening a bank account, says Davison. That is why, he says, many hundreds of thousands of users are signing up to BigPay. To him, it means that users are now more willing to use alternative financial services such as BigPay to enjoy the benefits of going cashless. “We currently have a high active rate — two-thirds of our cardholders use it every month. We also have a high transactional volume, which is very motivating. For now, we would like to focus on improving customer service to really win against the banks. Signing up only takes five minutes, getting the card only takes three business days, and we try to resolve problems immediately,” says Davison. The company will launch other products in the future. Everything will be done in stages as it wants to remain nimble and agile. “We have so many things on our product road map — we are a start-up after all. We change things all the time. We may prioritise certain things and drop others as we go. But for now, we are working on giving the best service to consumers in Asean. Hopefully, we can announce more big things soon,” says Davison.